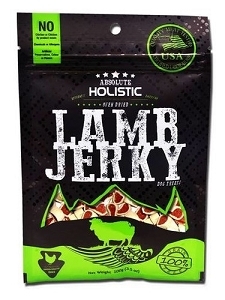 These jerky treats are made with lean cuts of wholesome meats, slowly flame-grilled to lock in the rich flavours and authentic aromas. They are also made in small batches and oven-dried to maximise the uniquely moist texture. 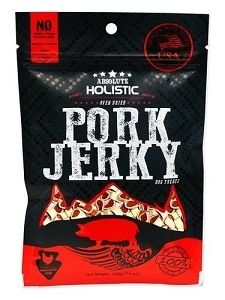 ABSOLUTE HOLISTIC JERKY offers a finger-licking good taste direct from the heart of our kitchen! Made in small batches to maximize our uniquely moist texture, we start with the good lean cuts of wholesome, delicious meat .Then we take the time to flame-grill our meats to perfection to make sure we’ve locked in the unexpectedly rich flavours and authentic aromas that your pet loves. Unlike other jerky, ours finishes with a slightly smoky flavour that’s sure to have your pets reaching back in the bag for another piece. 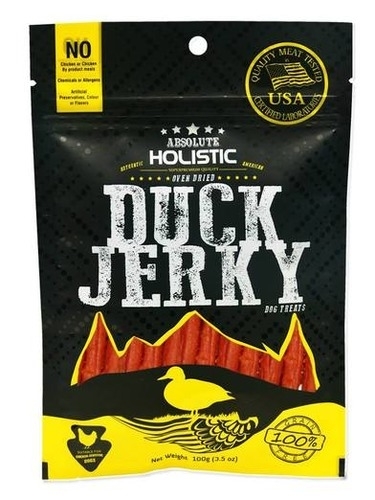 Brimming with mouth-watering taste, our incredibly satisfying, astonishingly delicious and tender jerky will go so far beyond your expectations that you’ll never settle for other jerky again. All Meat Tested in USA-certified Laboratories to ensure the safest quality for your pets!